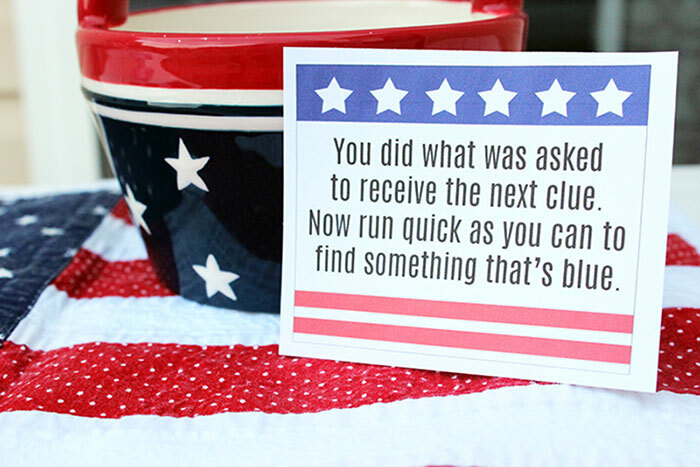 Kids will love this July 4 party scavenger hunt complete with printable clues! One of the coolest things about our house is that we can see our town fireworks right from our backyard. Which means two things - we don't have to fight crowds to get a good seat and we have a perfect excuse to throw a July 4 party! 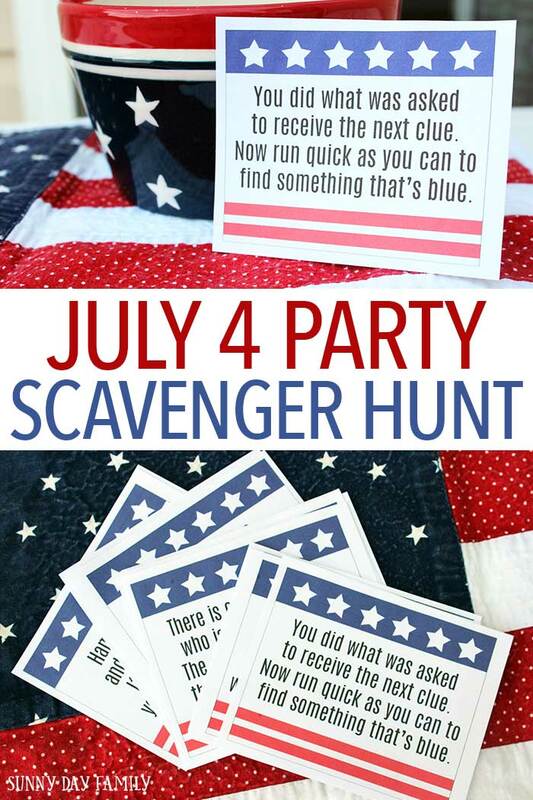 I'm always looking for ways to keep the kids entertained while we wait for the fireworks to start and this year I'm putting together an awesome July 4 scavenger hunt that I know everyone will love. Our love of scavenger hunts began this past Christmas when I surprised the boys with a Gingerbread Cookie Scavenger Hunt after school. They loved it so much that I created one for St. Patrick's Day too! These scavenger hunts are super fun and perfect to get kids moving and thinking. It's a great way to keep them entertained at your July 4 picnic this year! And I've done all the work for you with a set of printable scavenger hunt clues and instructions. 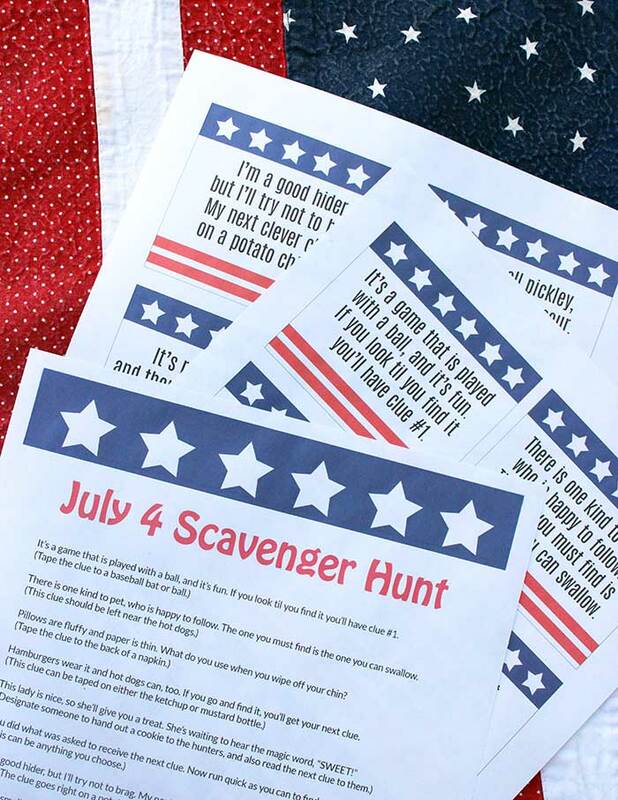 To set up your scavenger hunt, start by grabbing my printable scavenger hunt set. Just click the button below to get yours. The set includes 10 pre-made clues and a set of instructions for where to put them. 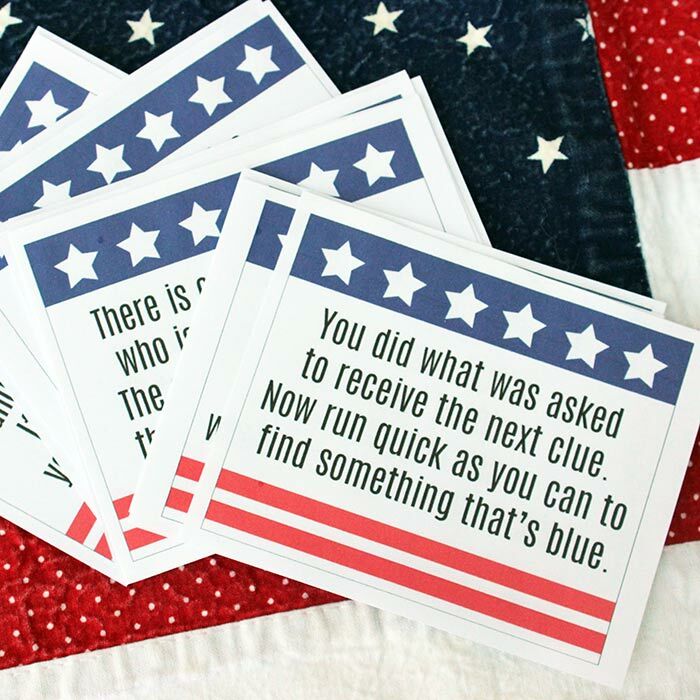 You'll also get 2 blank clue cards so you can make your own extra adventures if you'd like. I recommend printing the cards on cardstock so they are nice and sturdy. Once you've printed the set, simply cut out the cards and follow the instructions to place them around your party area. Then invite the kids to follow the clues to find a treasure at the end! You can make their reward anything you'd like, from popsicles to bubbles or even their own mini flag. This is such a fun activity for kids while they are waiting for the fireworks. And you can play at any summer gathering! It's quick and easy and the kids will love it (even the grown ups can give it a try). Ready to bring a little excitement to your July 4 party? Click the button below and get your scavenger hunt today!